UPDATE June 28: Eviction alert! #SquatBo Owner wants squatters to get out until 06:00pm today (June28). The squat at the Hernerstr 131 in Bochum is under immediate threat of eviction. Originally a foreclosure sale was planned for today. Local authorities were the creditor of the former building and many groups demand to use the building for affordable living and a social center. The fairtrade GLS Bank even offered to finance the legalization of the project. Although the squatters didnt decide yet if they would buy or rent the building as a collective, the possibilities for legalization of the building were there when local authorities sold the building to an investor on Monday. The mayor of Bochum stated on WDR TV that he is looking for a “peaceful solution” and that he wants to talk with the squatters about housing policies in Bochum. What the mayor didn’t say is that an eviction is always an act of violence. By saying he is looking for a “peaceful solution” the mayor of Bochum is putting up nothing more than a smokescreen. 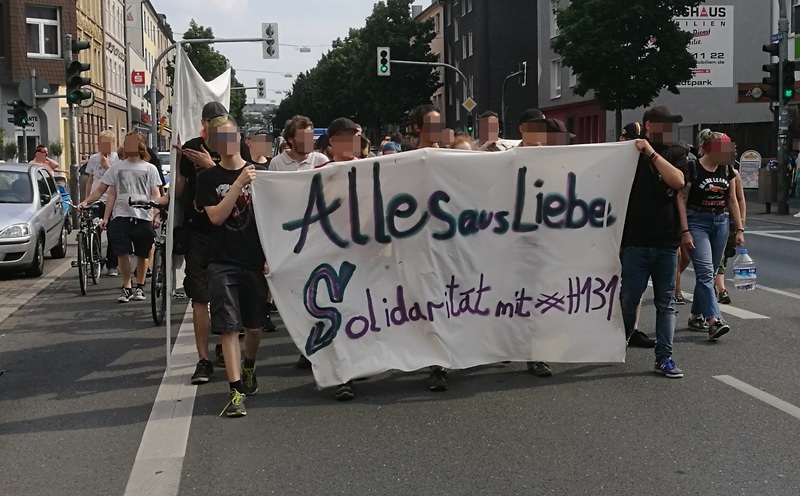 On Tuesday activists demanded that the squat at Hernerstr 131 will not be evicted during a gathering and spontaneous demo in Bochum. Image gallery: Gathering and demo in Bochum on June 20th. Activists are calling to come to the house at Hernerstr 131 in Bochum on Day X in case the squat really will be evicted. When the building gets evicted there also will be a demo in the city center of Bochum on the same day (06:30pm) and another demo at the Saturday after a possible eviction at 03:00pm. For updates about a possible eviction and actions follow hashtag #SquatBo and @SquatBo at Twitter. Earlier this week the #UnsereVilla squat in Kassel, Germany was evicted. On Tuesday about 300 people took the streets to protest against the eviction and to announce that the struggle for a social center in Kassel will continue. Demo against the eviction of Unsere Villa in Kassel, Germany earlier this week. In Athens a court ordered the eviction of 3 refugee squats. One of the squats is the City Plaza refugee accomodation. Activists call for an international day of action for all squats on Friday June the 23th. Solidarity Actions Across Europe For #CityPlaza, #SquatBo and All Other Squats | Enough is Enough!